The garden chairs will have to wait for me to sit in them. And when I do stop long enough to sit down, it appears I'll have to fight some shrubs for the best seat. No matter, I'm enjoying a lot of gardening these days. I planted out the vegetable garden with the warm season crops... beans, corn, squash, peppers, tomatoes. I also cleared out the bed along the fence where I grow annual flowers and sowed seeds for zinnias, marigolds, and sunflowers, plus a few morning glory vines because I got some seeds to try out. Goodness, I hope I don't regret sowing those morning glory seeds. I've also planted out a whole bunch of perennials. 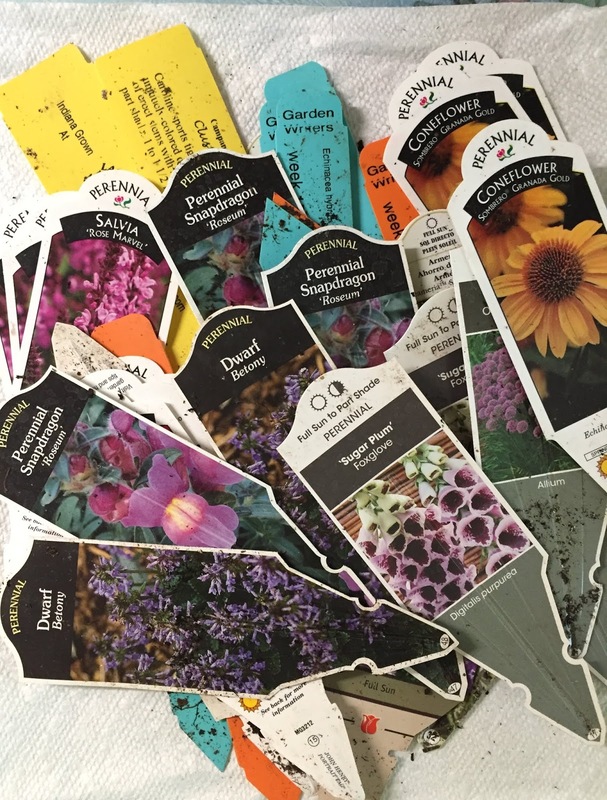 I got some of the perennials from Darwin Perennials to trial in my garden, others I bought during a garden center/pub crawl with my garden club. Still others I bought from more local places. I'm proud to say they are all in the ground in their new homes! I've also pulled out a few plants, including a bunch of asters in Plopper's Field that have always been in the wrong place. They were so easy to pull, those asters. Hardly any roots to them. Once they were gone I could see how much space they were hogging in that area. Suddenly I had room for my new perennials. I also pulled out some campanulas. I'm sorry I don't know which one it was. It had little blue flowers for about one minute and then just flopped over disgracefully. I believe I once heard Helen Dillon, from Ireland, say something about the greatest sin a plant can commit is to turn ugly as it fades. Or something along those lines. This plant defined that problem. Ugly after it bloomed. I have no time for a plant that blooms for a minute and then flops like that. I gave it a moment of silence, the amount of time it seems the blooms lasted, as I tossed it on the compost heap back in the Vegetable Garden Cathedral. Speaking of the Vegetable Garden Cathedral, it has given me over six pounds of strawberries this spring. The berries are small, but delicious. I've also picked some lettuce, pea pods, and a few peas. I don't think I'll get many peas this spring because of the messed up weather. What else have I been doing? More editing! Besides pulling out the asters and the campanula that blooms for only a minute, I chopped down the apple tree in the cathedral. It is too susceptible to fire blight and since I don't spray... I decided to cut it out. And because I had the reciprocating saw out, I also decided to cut down a forsythia that was in the wrong place and not all that colorful in the springtime. I have no time or space for a shrub like that. No one does! To end this post on happy note, I also have butterfly flower, Asclepias tuberosa, growing along the edge of August Dreams Garden. I hope some Monarch butterflies find it, lay eggs on it, and then the larvae can eat the leaves as long as they want to! I'm generous like that, when it comes to butterflies and other pretty insects. Speaking of which, I saw the first lightning bug last night. And the clover is blooming in the lawn. Truly it is now summertime, but my garden chair will have to wait. There is still a lot of gardening to do around here! Love the garden center/pub crawl as a garden club event. First lightning bug and you don't spray anything in your garden--those two are related. I'll keep reading for your Monarch posts. Ours have moved on. Don't forget to wind up that hose! You've been busy. I'm going to get out there today too! The strawberries look delicious. I saw my first butterflies this weekend. Spring is here and summer cannot be far behind. June is a wonderful month for time in the garden and you have certainly been busy! I can relate as I've been known to prune and weed until ready to drop, then plop down in a chair for about a half an hour or so, or until I can move again. Keep up the good work. Your strawberries look amazing and delicious!